The past always catches up to us. How you face it is the true challenge. In the Mad One’s exceptionally flawless The Essential Straight and Narrow, we watch as the personal history of a fading band arrives in the present forcing them to face it head on. Created by the ensemble, The Essential Straight and Narrow takes you on a voyeuristic journey through love and pain. 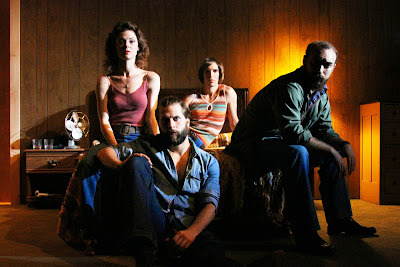 The play opens with stark fluorescents and a woman on the phone in a dingy motel room. She hangs up the phone and has the same call again. And suddenly she crosses over from motel room to the natural setting of the New Ohio. Is she rehearsing a movie of her past? Perhaps as the fluorescents are swapped out for theatrical lighting and a cast of characters from her past. We soon watch this woman, Jo, reconnect with her collaborating partners Paul and Graham, who also was a former love, as they are about to embark on a reunion tour of sorts. While rehearsing, rehashing the problems of the past, we meet the loveable Debbie, the transgender motel matron, who, through her hokey, sentimental stories and games, brings the trio together as they experience further heartbreak. The entire ensemble is wonderful, but it’s the main quartet that rules the stage. Stephanie Wright Thompson as Jo offers an incredible and transformative performance. She has impeccable timing, both dramatic and comedic, and offers a heartbreaking portrayal of a woman trying to move forward. Marc Bovino is delightful as Debbie. His creation of this woman is beautiful, carrying a world of emotions throughout the performance. Joe Curnutte as heartthrob Graham embodies the time. Michael Dalto as the third member of the folk trio is often forgotten, playing up the strengths of the part. Director Lila Neugebauer does a sensational job going from world to world, guiding her troupe through the story. Aided by a phenomenal overall design, Neugebauer and her team do nothing but wow us. From Laura Jellinek’s ingenious set to Mike Inwood’s striking lights to Asta Hostetter’s period-popping costumes to Stowe Nelson’s subtle sounds, everything is cohesive. The Essential Straight and Narrow is never what it seems. Expect the unexpected and be ready to constantly be surprised. With a dynamic script that has the perfect blend of hilarity and emotion, The Essential Straight and Narrow is a production that raises the stakes for other companies to reach.